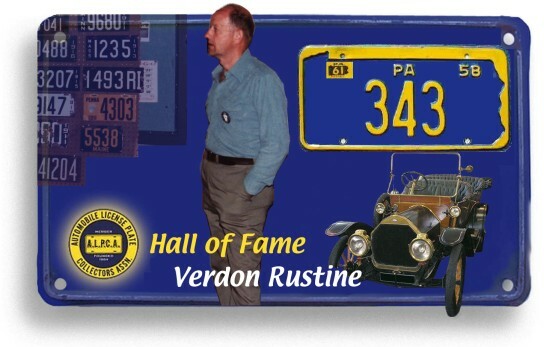 Verdon Rustine, born May 30, 1926 has called Pennsylvania home for nearly nine decades. A plate collector all his life, he found ALPCA in 1961 and the club has never been the same. During that time he and his brother Carl, ALPCA # 453 amassed one of the finest and most unique collections in plate history. Verdon has always been about giving back to the hobby. He has mentored hundreds of collectors and has epitomized the label of honest collector. A frequent attendee at Hershey and Nationals, Verdon has hosted meets in Pennsylvania and often shows up at regional meets toting along rare and unique tags for sale, trade or just exhibition. Mentoring is a rare gift and one need only have attended the Huntsville National in 2007 to see Verdon sharing table space with Chris Fretta, ALPCA # 8203 from Vermont, one of the clubs newest dedicated collectors. His spirit of sharing and making fair trades has given Verdon this great reputation. To count Verdon among your friends is a gift to cherish. And now a word from some of his many friends. No, Verdon isn.t very showy, nor has he held ALPCA office, but he represents the heart and soul of the hobby. A more fair and honest a member has not been seen since he joined and we have many, many fair and honest members of this great fraternity. I am honored to call him friend. Clearly the heart and soul of this fraternity. Verdon excels at the person-to-person contact. He is especially proud of attending all but one Hershey car show going back two years before it was an official event. I met Verdon for the first time at my first ever Hershey car show in 2007. His advice and guidance were instrumental in my joining ALPCA and getting infected by this disease of plateotosis. A more unassuming collector I have never met. Not concerned with the profit in selling you that rare plate but knowing that he has influenced a young collector to share the spirit of the hobby and pass it on to others. If we had more space we could add dozens more testimonials but we don.t. The judges have voted and Verdon meets the criteria. It is with extreme pride that we welcome Verdon Rustine to the ALPCA HALL OF FAME.